AQUAFLEX is a unique sensor that measures both soil moisture and soil temperature. The AQUAFLEX sensor is a 3m (10’) long flexible tape that can be laid in to soil in a variety of configurations to suit the application. In a loop to fit in a confined space etc. 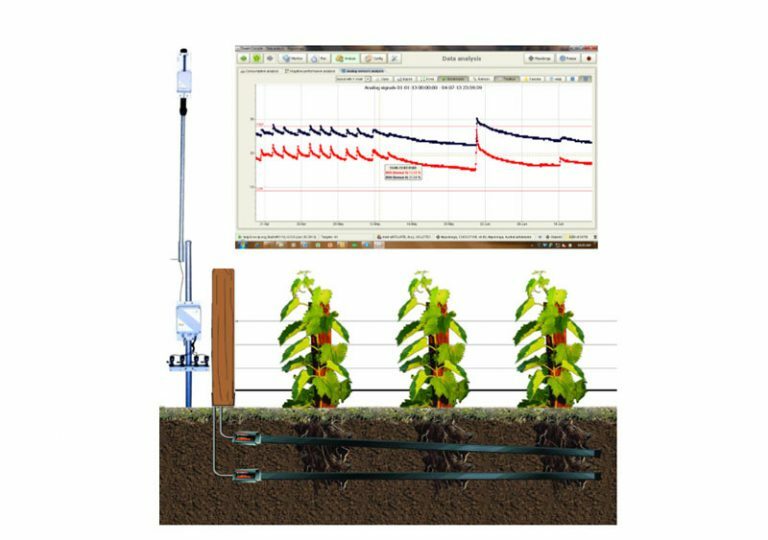 The 3m long sensor means that AQUAFLEX soil measurement provides spatial averaging over this length of cable and measures a 6-litre volume of soil around the sensor. This is extremely important given the variability of soil (even in well prepared plots) and non-uniformity of water application etc. The AQUAFLEX sensor also measures soil temperature at one end of the sensor. AQUAFLEX is the only soil moisture sensor that measures over a large volume of soil thus providing representative and repeatable results. AQUAFLEX can be supplied in various configurations to suit the application, from spot readings using a Smartphone via Bluetooth to full logging capabilities via Dream 2 and Vision 2 irrigation controllers complete with PC software, or alternatively as a component sensor for connection to other manufacturer’s loggers and controllers. Telemetry options are also available to allow remote operation by radio communications. With the cellular option, you can access your AQUAFLEX data from anywhere in the world! AQUAFLEX sensor has its own built in datalogger so it is completely self-contained. One of the biggest problems with most soil moisture monitoring devices is that they measure moisture in a very localized area. This is a problem because soil moisture is not uniform. Many factors affect the uniformity of soil moisture, including the uniformity of irrigation and rainfall, crop root distribution, microclimate and soil properties. In most soils and growing conditions, soil moisture and temperature vary dramatically over time. Continuous monitoring provides the full picture that shows just how widely and quickly these changes are taking place. Continuous monitoring also removes the worries of missing key readings. You simply collect the information when it is convenient for you – without missing anything important that has occurred. How Do You Use THE AQUAFLEX LOGGING SENSOR? First, you bury one or more AQUAFLEX Logging Sensors in the soil and locate the Battery box on a post or in a valve box. Next set your desired sampling interval. Periodically, you download the data from the logging Sensor via Bluetooth to smartphone to a computer or Laptop PC. Then you use the AQUAFLEX software or Dream PC Console software to create graphs of soil moisture and temperature. The information on the graphs can be used to determine when and how long to irrigate. Target moisture set points (full and refill points) can also be added to the graphs. Unlike traditional probes the AQUAFLEX takes the average soil moisture and temperature measurement over a 3m sensor. The AQUAFLEX sensor is very flexible allowing it to be placed in almost any position eg in an ‘S’ shape etc. AQUAFLEX uses a patented electronic technology to measure the dielectric constant of the soil. Since the soil dielectric is a moisture-dependent property, these measurements can be converted to accurate measurements of volumetric soil moisture (the amount of water in a given volume soil). AQUAFLEX uses signal processes which are similar – but superior – to time-domain reflectometry (TDR). Special processes have been developed that allow TDR-like measurements over a longer conductor and improve the correction of these values for soil temperature and salinity. How Accurate is the AQUAFLEX Sensor? Measurement precision depends upon soil salinity conditions, but for normal agricultural soils measurements should be precise within two percent volumetric moisture, with a measurement repeatability of about 0.25 percent volumetric moisture. Soil temperature measurements are accurate to within 0.9 OF (0.5 OC). What is the Moisture Range on the Sensor?